For veterans whose service did not end with the military, the new Washington Department of Veterans Affairs (WDVA) Veterans Peer Corps (VPC) program provides training and local resources to help them connect with other veterans in their own community by providing valuable resources and opportunities for interaction. Tacoma will host an upcoming Veterans Peer Corps Training at Pacific Lutheran University Friday, Jan. 18, 8 a.m. to 5 p.m., for veterans, resource providers and their families. A Veterans Peer Corps member is a veteran, or a veteran's family member, who receives training and certification to serve as a peer mentor by facilitating meetings and activities. Veterans Peer Corps mentors build community-based programs that connect veterans from all eras and backgrounds to each other; create opportunities for veterans to gather and participate in activities; and build camaraderie and trust through ongoing coaching, training opportunities and support forums. "I had all sorts of emotions running through my head with having a 100 percent service connected disability; I felt inadequate and was concerned about trust issues," said Seattle VPC attendee. "I thought to myself about all the fears and doubts I had when I finished my enlistment." Veterans have a need for support services, including peer-to-peer interaction and connections, and many veterans need to talk about their experiences with combat, deployment, or other situations experienced during their time in the military. "What started out for me as an information session soon became a day of healing, personal growth and mentorship," said a Seattle VPC attendee. Serving in the military typically provides people with a unique sense of community and connection to one another. That is what makes the VPC work so well -- who better than a fellow veteran to reach out and invite other veterans to join them, and to make sure they are connected to each and every benefit they earned by serving in the military. "(After attending) I feel better prepared to engage veterans in need with resources available and overcome the fear of expressing weakness by sharing. This class made me realize that I/we have the power to really help our brothers and sisters," said a Bellingham VPC attendee. 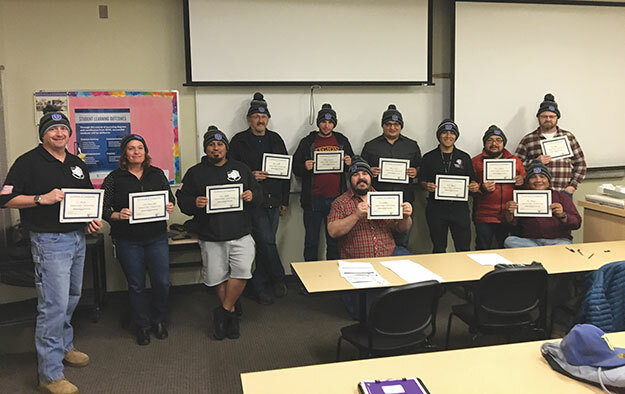 So far, there have been nine Veteran Peer Corps Trainings held in Bothell, Spokane, Ellensburg, Bellingham, Wenatchee, Seattle, Longview, Federal Way and now Tacoma. This has produced more than 100 Veteran Peer Corps Mentors trained in their respected communities that are available to identify mentees and are available for local veterans to connect to. This program aims at building a veteran community no matter where you are located in the state. "Here in Wenatchee, we might be limited to the resources for veterans, but having peer mentors in the area is another tool for the community to get the veterans the help they need," said a Wenatchee VPC attendee. No matter the location, the VPC trainings will help veterans connect with other veterans. "As the day went on, I met people from all branches of service who reminded me of what family is. We shared many similar interests and had the opportunity to open up and share some of our deepest fears," said a Seattle VPC attendee. "Some of us cried, some of us laughed, but as we finished off the day with a closing ceremony, I felt empowered ... This training stirred up a new passion I never knew was there. I am and now will always be a life-long learner and veteran advocate." Out of respect for all included veterans' privacy in regards to seeking support, no names were used in the included quotes. To sign up for the Veterans Peer Corps training in Tacoma Jan. 18 and/or to learn more about the program at dva.wa.gov/program/veterans-peer-corps or contact Bryan Bales at Bryan.Bales@dva.wa.gov.